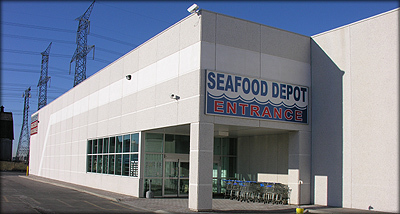 Seafood Depot was established in 1997 and could be classified under the "big box retail" concept. In its approximately 25,000 sq. ft. retail area, an extensive selection of the delicacies that inhabit our waters is available fresh, frozen or live. All products are displayed in very attractive display cases, freezers or tanks. The processing plant is directly behind the retail section for guaranteed freshness and quality control. Seafood Depot also offers a wide selection of non-seafood items. The store sells mineral waters, fruit drinks and bottled waters that are all imported from Europe. As well, there is a wide-ranging product line of pastas, biscuits, sauces, olive oils and many other items that you can not find in a regular grocery store! In addition, Seafood Depot has an extensive line-up of housewares and gifts at extremely competitive prices. Seafood Depot is quite possibly the largest seafood outlet in the world and has a variety of fresh and frozen seafood products like none other.